The term “Mainland Polychrome: Matt-painted” (hereafter: Mainland Polychrome) comprises a taxonomic device serving a ware classification. Surface treatment i.e. light and burnished, is here regarded as the main taxonomic unit, being obvious and present to all examples; in this aspect the definition of the pottery as “Dark-on-Light burnished” would be precise enough. A multiple classification system of different polychrome pottery types is shown on table 1; each one is treated as a ware category (two left columns), while in the right column it acquires a proper definition as a decorative class. Mainland Polychrome is, thus, a decorative category of the wider Dark-on-Light decorative system, applied on burnished surfaces, which constitute the main attribute of the pottery type known as Yellow Minyan. The variables of Mainland Polychrome as a decorative category are confined to the sphere of surface treatment, including decorative techniques, type of paint, motives and syntax (see FIGS 1-2). 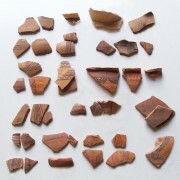 The use of more than one color in the decoration of a burnished surface is considered here as the main criterion for the identification of a pot or sherd as Mainland Polychrome. Red and black substitute the main colours and the surface is always burnished. Emphasis lies on the shoulder zone bordered by vertical and horizontal bichrome bands that form symmetrical spaces. The motives (Dietz 1991, p. 223) are similar to those encountered in contemporary monochrome pottery (i.e. Mylonas 1973, Pl. 52α, 53β1, 53γ) and fall well within the MH decorative repertoire. A distinct remark of the decorative syntax of Mainland Polychrome is the unity of the colors that act as one, a feature that separates this one from other polychrome decorative systems (i.e. Argive bichrome ware 2 and Thessalian Matt-painted pottery 3). The definition of Mainland Polychrome as a decorative style is reinforced by the range of forms, where such decoration is applied, being wide enough to reduce typological analogies and varying from small fine to large coarse vessels. Especially indicative is the variety of shapes decorated in this style in grave VI of Circle A (see FIG. 3) at Mycenae (Karo 1930-33, 163-168 and Dietz 1991, 220-221). The majority of shapes are also encountered in other pottery types, decorated in different styles or left plain. For example, the well represented in Mainland Polychrome two or four-handled jars (i.e. Δ-63 and O-193 of Circle B) 4 find commonly plain equivalents (i.e. no. 590 of grave IV of Circle A) 5. The same goes for most of the shapes with mainland polychrome decoration. This is also supported by shape observations on inter-regional level, since Mainland Polychrome uses prevalent forms of different local productions. In Boeotia, thus, it is present in large shapes like kraters and stamnoi, while in the Argolid it is applied in small-sized vessels, as another decorative style of fine ware. Apart from the definition of Mainland Polychrome, Table 1 reveals its typological relevance, stressing the role of another variable, that of the burnished surface. Viewing Mainland Polychrome as a decorative variety of central-Greek burnished pottery comes along with a great number of consequences of both spatial and temporal significance. The width of forms of burnished pottery types corresponds to that of Mainland Polychrome. The same is claimed for more detailed shape characteristics like the so-called hawk’s beak rims of kraters and the necks of jars with thickened and squared rims. In many cases pots of burnished wares are decorated with dark matt paint of one or two colors. Another important group of fine pottery where matt-painted decoration was often applied on burnished ground is Dietz’s “Argive Light ware” (1991, 149-198), a group, that coincides with Davis’ Matt-painted II class (1979, 243). A proper chronological assignment is crucial for Mainland Polychrome pottery, imposed by its presence in important deposits, like the two Mycenaean Grave Circles. Its chronology is relevant to the long discussion concerning the phase division of the early Late Helladic period 6. The lack of secure contextual references is still considered the main problem. Mainland Polychrome decorative motives should be chronologically defined as their equivalent monochrome and its shapes as equivalent to the unpainted ones. It was first identified as a final MH product (Buck 1964, 291 and Schachermeyr 1976, 218). After Davis’ publication of stratum ΧΙΙ-ΧVI of East Alley of Korakou (1979) the deposits including relevant pottery were contributed to the beginning of the Late Helladic period. The sequence of appearance of Mainland Polychrome in the two Grave Circles, being relatively short, is also indicative of its chronological framework. As far as this pottery is concerned, Dietz followed a different argumentation in his two well-known publications: while arguing for a final MH IIIA chronology for the first Mainland Polychrome pieces and a peak in MH IIIB (Dietz 1980, 142-143), he finally supported a first appearance in LH IA and a certain frequency in LH IB (Dietz 1991, 92). The main reason for this turn was his belief that LH I period of Furumark and Dickinson was in fact LH IB (1991, 92), a belief that inductively led to a chronological re-evaluation of closed deposits, based to some extent on the presence or absence of Mainland Polychrome. What remains highly equivocal is the role Asine played in the chronological attribution of the latter, since very few pieces have been found there. Apart from this case there is a limited number of deposits, which offer some clues for the chronology of Mainland Polychrome, either through a secure overall chronological assignment or a reliable contextual analysis. At this point, we should note the closed domestic pottery group of K. Geli plot at Thebes securely dated in LH I. Tsoungiza offers also a secure context for a LH I chronology (Rutter 1989, 10), while the third level of Eutresis should also be dated to LH I and II periods, as A. Philippa-Touchais’ (2006, 698) new chronological division indicates. In the secure contexts of Mainland Polychrome we should also add Akrotiri on Thera, since the pottery is found in early Late Cycladic sequences (Nikolakopoulou 2007, 352). The context of Mainland Polychrome seems to be quite different in sites north of the Isthmus, where LH I, as defined in northeastern Peloponnesian deposits, is lagging (Dickinson 1989, 134). It is obvious that we should base our chronological judgments on other criteria as far as this central region is concerned. Could Mainland Polychrome pottery be used as such? For the time being and as far as this region is concerned, we can say that early Late Helladic pottery follows the MH tradition with the large majority of pots belonging to light burnished wares. Dating Mainland Polychrome in an advanced period of LH I might be justifiable in specific northeastern Peloponnesian deposits, which should not be taken as strict guideline for a general chronological scheme in pottery typology. In the wide central-Greek region other pottery types and sequences define the same period. The presence of Mainland Polychrome in both regions was, of course, simultaneous; what changes is the ceramic context in which it is found, characterized in central-Greece by the lack of easily datable material. In conclusion, Mainland Polychrome should be regarded as product of a certain ceramic tradition, that of wheel-made burnished pottery. In this respect the term transitional should be retained, being in fact indicative for the period of its appearance and used in a scale of typological relativity. As a product that follows the Middle Helladic tradition, its character will be better conceived through the study and publication of more central-Greek deposits. Buck, R.J. 1964. “Middle Helladic Matt-painted Pottery”, Hesperia 33, pp. 231-308. Davis, J.L. 1979. “Late Helladic I Pottery from Korakou”, Hesperia 48, pp. 234-263. Dickinson, O.T.P.K. 1989. “The Origins of Mycenaean Civilisation revisited”, Aegaeum 3, pp. 131-136. Dietz, S. 1980. The Middle Helladic Cemetery. The Middle Helladic and Early Mycenaean Deposits. Asine II,2. Results of the Excavations East of the Acropolis 1970-1974, Stockholm. Dietz, S. 1991. The Argolid at the Transition to the Mycenean Age: Studies in the Chronology and Cultural Development in the Shaft Grave Period, Copenhagen. French, D. and E. 1971. “Prehistoric Pottery from the Area of the Agricultural Prison at Tiryns”, Tiryns V, Mainz, pp. 21-40. French, D.H. 1972. Notes on Prehistoric Pottery Groups from Central Greece, Athens. Maran, J. 1992. Die deutschen Ausgrabungen auf der Pevkakia-Magula in Thessalien III: Die mittlere Bronzezeit, Bonn. Karo, G. 1930-33. Die Schachtgräber von Mykenai, Munich. Mylonas, G.E. 1973. Ο Ταφικός Κύκλος Β των Μυκηνών, Athens. Nikolakopoulou, I. 2007. “Aspects of Interaction between the Cyclades and the Mainland in the Middle Bronze Age”, in Middle Helladic Pottery and Synchronisms, eds. F. Felten, W. Gauss, and R. Smetana, Vienna, pp. 347-359. Philippa-Touchais, A. 2002. “Aperçu des céramiques mésohelladiques à décor peint de l’ Aspis d’ Argos: La céramique à peinture mate”, BCH 126, 1-40. Philippa-Touchais, A. 2006. “Η Μεσοελλαδική Εύτρηση. Επανεξέταση των αρχιτεκτονικών δεδομένων”, in Πρακτικά Α΄ Συνεδρίου Θεσσαλίας/Στερεάς Ελλάδος. Rutter, J.B. 1989. “A Ceramic Definition of Late Helladic I from Tsoungiza”, Hydra 6, 1-19. Schachermeyr, F. 1976. Die Ägäische Frühzeit. Band II. Die mykenische Zeit und Gesittung von Thera, Wien. 1 Mainland Polychrome pottery is the subject of my Ph.D. Dissertation at the University of Athens that is still ongoing. With this opportunity I would like to thank the State Scholarship Fund, the University of Athens and the I.F. Kostopoulos foundation for their financial support on my research. I would also like to thank all scholars who have granted me permission to see relevant material. 2 See particularly Philippa-Touchais 2002, Fig. 7.35 with kantharos no. 1267-3. 3 Maran 1992, Pl. 80.1-2, 81.2, 92.20, 105.8 and 111.3. 4 Mylonas 1974, Pl. 65a and 170a. 6 For a condensed presentation of the problematic see Dietz 1991, 23-26. Mathioudaki, I. "Mainland Polychrome Pottery: Aspects of Typology and Chronology." 19 May. 2009. In: Horejs, B. - Pavúk, P. (eds. ): Aegean and Balkan Prehistory. http://aegeobalkanprehistory.net/index.php?p=article&id_art=16 (24 Apr. 2019).